Brakes are a relatively simple mechanical element to your restoration, but of course a critical one to get right. You can probably purchase a ready made brake pipe kit to suit your vehicle though these vary in accuracy and in our experience the pipe lengths tend to be cut on the economical side. There is also some debate on the use of copper for brake lines, it being banned in the USA and Australia for instance. Many vehicles in the US after WW2 utilised copper lines but it was found they went brittle with the constant vibration and cycles of pressurisation, then broke, with catastrophic results. 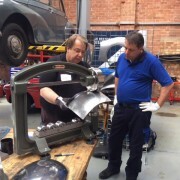 The material is popular for restorations in the UK and one can presume that classic vehicles with them have never reached the level of use over many miles that could cause an issue. We tend to use Kunifer (Cupro/Nickel) on our restorations as this is a nice compromise between the longevity of Copper and the strength of steel whilst being soft enough to form by hand. Please check what you are buying on auction sites as there is some thinwall far eastern stuff floating around that is half the wall thickness it should be! The next step is to invest in a good brake pipe flaring tool and the trick here is to avoid the cheapest ones that mean you have to swap out tools every time you make a flare. 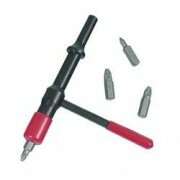 For under £30 you can buy a good piece of kit that you can rattle out pipes quickly and even add a fitting in situ which is handy sometimes when judging pipe lengths or trying to feed a pipe through a narrow gap. Finally, use the right grease. Everyone knows about copper grease on the back of the pads to prevent squealing but on sports cars, especially those used on track days you might be better off with a high temperature Alumimium/Graphite. especialy with high temperature ‘Sports stuff’ pads. If you are rebuilding your Brake Calipers (immerse in IReOx to de-rust internally) and master/slave cylinders then Red Rubber Grease is a boon. It helps the rubber components slip into place and keeps them coated and soft whilst you finish the rest of the rebuild. It then dissolves in brake/clutch fluid. We do ‘one car’ pot quantities that will last for months and save you throwing a big tub away.